We are proud to announce one of our most exciting company wins yet: collaborating with the Clara Lionel Foundation. Founded by Robyn “Rihanna” Fenty, the Clara Lionel Foundation supports and funds groundbreaking and effective education, health and emergency response programs around the world. With the voices of Rihanna and her fans, CLF also engages in global advocacy with the goal of improving the quality of life for young people everywhere. We would be hard-pressed to find a foundation more aligned with our objective to #wintogether on a global scale. 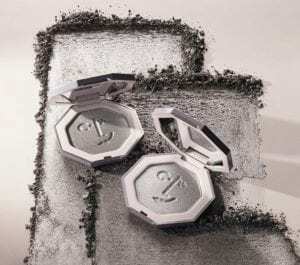 Most recently, CLF has partnered with Fenty Beauty, Rihanna’s celebrated, broadly inclusive cosmetic brand, on a new limited-edition makeup highlighter and Diamond Ball sweepstakes to raise critical funding for CLF. 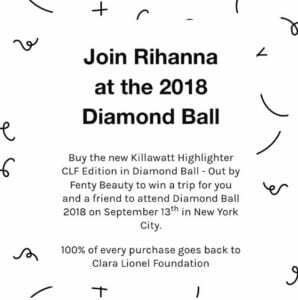 Each dollar donated or spent toward the highlighter purchase counts as one entry into the Diamond Ball sweepstakes, and 100% of funds will support CLF’s mission-critical initiatives in emergency responsiveness and education around the globe. Lottery.com is proud to power the sweepstakes platform that will give one very lucky winner the experience of a lifetime to fly to New York City, stay at a five-star hotel, walk the Diamond Ball red carpet, and attend Diamond Ball 2018 with a guest. 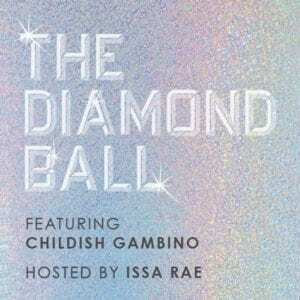 In its fourth year, this year’s ball will be hosted by Issa Rae and headlined by Childish Gambino. Full details and sweepstakes rules can be found at 2018diamondball.com. There are three days left to enter! Looking to stay up to date on the latest Lottery.com news? Follow us on Twitter and Facebook @lotterydotcom!